Here's a Blades of Brim quick tips and walkthrough guide on how to farm Coins fast, and earn items in-game to boost up your High Score Bonuses or multipliers. 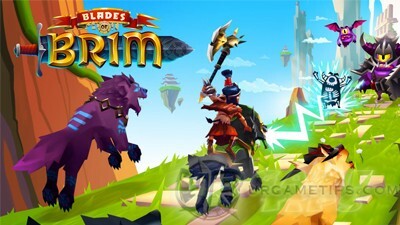 Blades of Brim is an endless running action game presented by SYBO, available to download on the App Store and Google Play. Join forces with the heroes of Brim to save the world from the invading army of Goons! 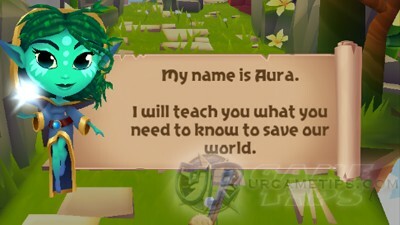 - Connect to Facebook to save your progress and to receive free 50 Essence. - Claim your free Common Chest every 4 hours. 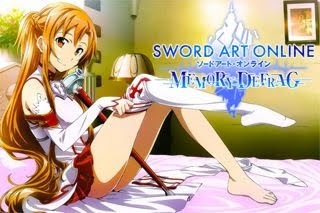 - Complete Daily Quests to receive free Coins and Rare Chests. - Reach Achievement milestones to grab more Essence. - Earn Loots from the Goals section to get some free stuff. - Check your in-game Mail for event based freebies. Add Facebook Friends For More Coins! - Optional: Add Facebook friends in-game to gain more Coins everyday (check Goals > Friends section in-game for more info). You may use the comment section below to let others add you, just post your Facebook Profile Link. - For upgrading Powerups (early game), Weapons, and Pets (late game). - Earn and buy Epic Chests from the Shop mid game, then Rare, Common, or Event Chests to collect items. - Spend on Pet Whistles late game. - These are all optional though, especially for free players, and it should be done late game. - For purchasing Boosts from the Shop. - Used for the Revive Option to continue your run. - For purchasing specific weapons, armors, or pets from the Shop (for item completion). If you still don't have a nice Pet, you might want to consider this. - Buy Heroes that can only be unlocked by spending Essence. - Note: Upgrading powerups makes them last longer. Reach Lvl 24 to unlock all 4 Power-ups. - Turns enemies into Gold. Nice for farming Coins, just watch out for hidden pots behind those sack of Golds though. Works great with Golden type weapons for more Coins. - Gain Invincibility. This power-up can save you from hits, crash and falls. A very handy power-up and works great with weapons that gives Hit Protection. 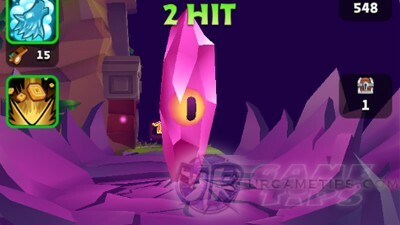 - Defeat enemies with 1 HIT. Excellent power-up to have once you reach Difficulty 5, where more armored goons will start to show up. - Gain Flight and Coin Magnet. Also a nice power-up for farming Coins. Jump to go higher, and swipe down to return to the ground. - Can be used with Weapons that requires Ground Slam to activate their power. How To Do Ground Slams? - After hitting a flying monster, a wall-run, during a high jump or flight, swipe down to do a "Ground Slam", an AoE attack useful for defeating multiple enemies on the ground. - While in air, swipe down to do a "stomp" attack, use this to bounce on certain enemies or objects, just time it well. - Destroy Goon Crystals to gain 1,000 Coins. - Tip: Do not enter the first portal to quickly reach the 1st Goon Crystal, after destroying it, continue with your current quest, or just let your hero die and repeat the process. - Tip: Every time you unlock a new power-up, upgrade it right away to 5 yellow bars or MAX to increase it's duration, then earn your Coins again for the next one. - Yup, this is your first priority, spend all of your early game Coins into upgrading power-ups. - Upgrades Fees: 2,000 > 4,000 > 8,000 > 16,000 > 32,000 > 64,000. - Keep leveling up until you unlock Atlas. His default armors are perfect for beginners, unless you can get better ones from chests. - Any Hero that can equip armors with +Midas Touch and/or +Magic Shield duration. - Trusty Rusty (default weapon): Highly recommended weapon for beginners. Upgrade to gain an extra heart. - Simulacrum (free limited time weapon for new android players): A nice Epic weapon for beginners, upgrade to MAX right away. Activate it's effect during runs to destroy enemies around you until the end of it's duration. - Save your Pet Whistles, Boost Items, and Essence for later. - Any Hero with armors that can extend the duration of your preferred power-ups. 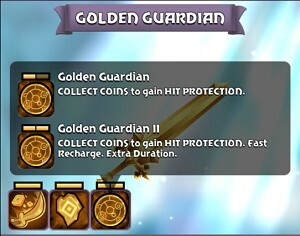 - Golden Guardian (got from Store - Epic Chest) or any "Golden" Type Weapon like Golden Mercy (Rare Weapon): These weapons are great for farming Coins, even better if you can get one with extra effects. 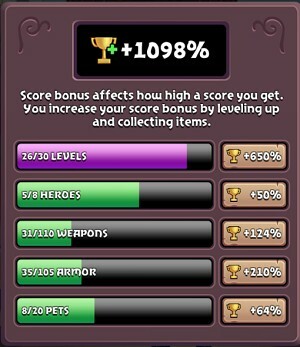 - Continue leveling up to unlock more Heroes, new types of Chests, and other in-game features. 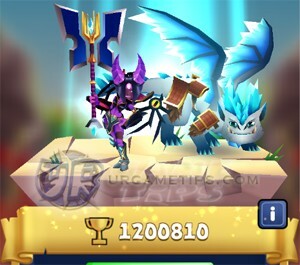 - High Score Multipliers will increase as you level up and gather more heroes, weapons, armors, and pets. Refer to the following tips on how to get them. - From the Main screen, tap on your High Score to check your current progress. This is now your main priority. - Farm Coins and use them to buy Epic Chests from the Shop. Hopefully, you'll be able to get a nice weapon with cool effects, some armors with better "+duration", and new pets. - Tip: To check if how many Epic Items you still need to get in the game, just scroll all the way down while browsing Weapons, Armors, or Pets. - Once you have some of the Epic items you want, start buying Common and Rare Chests. - Remember: Gray Items = Common Chests, Blue Items = Rare Chests, and Purple Items = Epic Chests. - Tip: If you want to farm chests, enter non-event based portals and complete the portal quest. - Portal Chests will drop: Coins, Essence, Pet Whistle, Weapon, Armor, Pet, and Boosts. - These are limited time items that you can only buy with tokens. Tokens can be farmed by entering event based portals, or by purchasing Event Chests from the Shop. - Not really recommended for free users though, and since most of them can be obtained from chests anyway. Unless, one of the items listed is the only item you need to complete your collection. - Do not upgrade Pets, only Weapons for now. - Use Pets only if you want to easily complete the required Combos for Portal Quests. Late Game: Get Ready to Boost Your High Scores! - You should now have reached the MAX Level in the game. If not, just continue, and also don't forget to MAX out your power-ups if you haven't done it already. - Continue and gather items that you don't have to keep your Score Multiplier. It's Time To Use Your Pet! - Select a Pet you like, preferably with a very long duration (around 20+ sec with no upgrades yet), then upgrade it to MAX to increase it's duration. 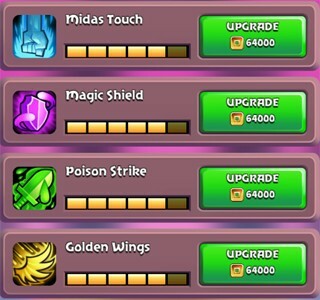 Note that some Pets will get more upgrade bars than others. 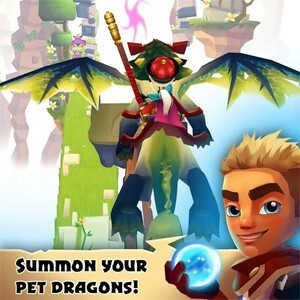 - Some Pets will also have extra ability, example: Dragons have flight. - Farm Coins and start buying Pet Whistles, the more, the better. - This is totally optional for free players, since you can also get them from chests. - Activate one or more Boosts you like at the start of each run. Preferably Score Boost because it can increase your Score Bonus to +100%. - Purchased from the Shop using Essence, but also obtainable from chests. - Simply by defeating enemies (rare ones are higher), pots, balloons, are some of the examples. - Make sure that you defeat those Goon Crystals too, to rake more scores. - Doing Wall-Runs will also yield scores. - Combos: Chaining combos is the challenge here, and you can easily do this by entering portals. Hit Combos increases your base Score Bonus Multiplier. - Keep hitting monsters, pots, and balloons (you might need to swipe up to hit some of these balloons though). - Summoning Pets: If there is a wide gap between 2 targets, or when after hitting the last enemy near the end of the portal, your Combo Hits will stop, so, to be able to keep your Combo Hits alive, it's best to summon your Pet right after hitting your last available target. - Best is when you are trying to set high scores. - Summon to keep your Combo Hits alive, especially when you have achieved more than 20 hits. - If you are about to fall leading to a certain death, quickly activate your pet to use it's double jump or flight ability. If you fail, your pet can still revive your hero. - When you don't have Magic Shield or Hit Protection on. - Tight places with lots of enemies. - Places where you need to do multiple wall-runs and falling ain't an option. - If you still want to continue, pay up the Revive fee to continue your run. - Revive will replenish all of your Hearts.